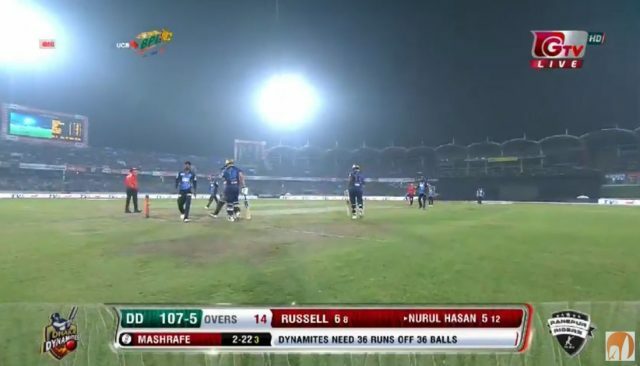 BPL T20 Dhaka Dynamites vs Rangpur Riders Qualifier 2: Rangpur Riders played against Comilla Victorians in qualifier 1 and now they will face off against Dhaka Dynamites in qualifier 2. This exciting match of Bangladesh Premier League 2019 will be played on 6 February at 6:30. At Shere Bangla National Stadium in Dhaka this match will be played. The match will telecast live in local time of Bangladesh at 6:30 pm. Dhaka Dynamite has changed to their playing eleven for the eliminator against Chittagong Vikings_ they have dropped Mizanur Rahman in favour of Shuvagata Hom. Rony Talukdar was sent in ahead of Sakib Al Hasan again. The Dynamites is playing against a strong team like them so what will happen in the match cannot guess. Sunil Narine and Sakib Al Hasan is the strong player of Dhaka Dynamites in this BPL. They have made a good rate in their bating section as well as good in bowling section. They have to be serious in both sections for wining. In this season Sakib AL Hasan makes 275, led the team and in bowing section with 21 wickets in 13 matches made him second best bowler. Naren picked 18 wickets and play a vital role for the team. Rony Talukdar, Kieron Pollard, Andre Russell, Rubel Hossain this all players are did well in last matches. Rangpur Riders two best players Alex Hales and AB de Villiers will not play on this match for their critical injury. Alex Hales was injured last week in at the match against Rajshahi Kings and AB de Villiers left the match too. They have been replaced by three players Benny Howell, Sohag Gazi and Shafiul Islam. Now we are expecting a good match with them. In the team of Rangpur Riders Rilee Rossow is played very well in the bating section. He is a player of South Africa and now playing BPL on RGR team. In the tournaments bats chart shows he made 558 runs. Chris Gayle played outstanding against Comilla Victorians. Mohammad Mithun, Mashrafe Bin Mortaza, Farhad Reza,Shafiul Islam played well for their RGR team.